If you’re a science teacher that values inquiry, harbors feelings of nostalgia for Mr. Wizard, or just likes to provide your students with curiosity-filled discrepant events like the one below, then you owe it to yourself to subscribe to the Smarter Everyday channel on Youtube. I love the way that Destin, the channel’s creator, walks viewers through the explanation of scientific phenomena with energy and passion. His ability to describe how the Prince Rupert’s Drop, a glass sculpture created by dropping molten glass into cold water, doesn’t actual shatter from the force of a hammer blow, but the subsequent vibration in the tip of the tail is fascinating! 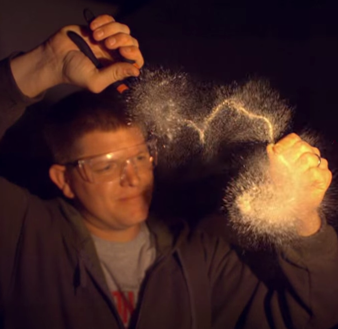 At first glance, the glass appears to explode when stricken with a hammer, but the slow motion video reveals that it survives the blow easily; it’s the vibration in the tip of the drop milliseconds later that causes the glass to shatter. It makes me wonder how engaging it would be to challenge students to find or explain their own discrepant events using Youtube. I know the majority of educators that use Youtube see it mostly as a vehicle for consumption, with students watching content. It would be interesting to see teachers pushing students to the point of analyzing and then creating their own science videos as a form of performance assessment. I’m sure many exist out there; the trouble is having the time to search for them all. I found the following URN Student Science Youtube playlist which appears to be a part of the University of Nottingham’s Student-run radio station. The production value is higher than average, which is to be expected by a college level production. It’s actually a bit exciting to see a project at the university level embrace the more casual and playful nature of the web to help educate others and provide some real world projects (creating the videos) for the college students involved. I’m tempted to see if I could convince a teacher I work with to create a unit in which their science students are given the same task.